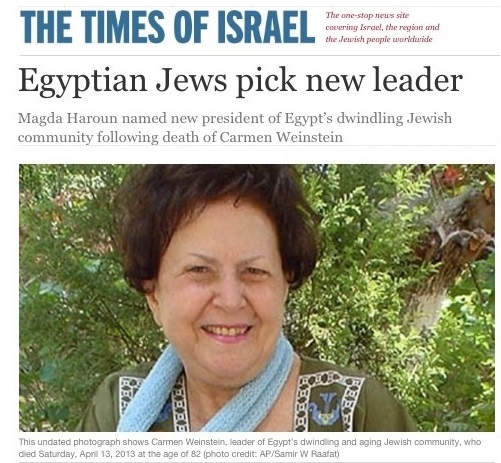 While it greatly saddens me that my first message to you as the new JCC president is an unhappy one in view of the unexpected passing of my predecessor Ms Carmen Weinstein, it gives me much comfort to know you are following our news through the different media channels. To me this has particular significance for it means our small community in Cairo is not alone in its moments of sorrow. Immediately following the passing of Carmen Weinstein on 13 April individuals from all walks of life contacted the JCC whether by calling, emailing, tweeting, telegramming, dropping a note, or by sending flowers. And naturally there were those who attended Carmen Weinstein�s memorial service last Thursday, April 18. At the daytime memorial and later during the evening session at Cairo's Chaar Hashamayim Synagogue, I saw many friendly faces and an equal number of strangers. I met with representatives of various foreign and Egyptian NGOs and senior members of the diplomatic corps. Also present were ranking figures from the intelligentsia, cultural performers and members of the media. Mourners included Muslims, Copts, Catholics and... you name it they were all there. And of-course I welcomed my coreligionaires some of whom had come from as far as the United States and from as near as Alexandria. They came to pay their respects to the person who against all odds had protected our physical, cultural and religious heritage at no little cost to herself in terms of effort, time and health. But what warmed my heart most is that I saw eager Egyptian youth who came because they were curious to learn about us. 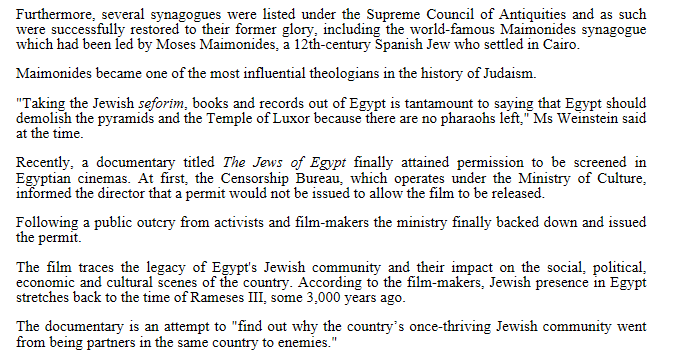 Some of them didn�t even know there was a Jewish (albeit the remnants of) community. All they wanted was to express their condolences for the passing of a fellow citizen whom they probably never met. All of the above were assembled together to honor the passing of a symbol of the Egypt that was. 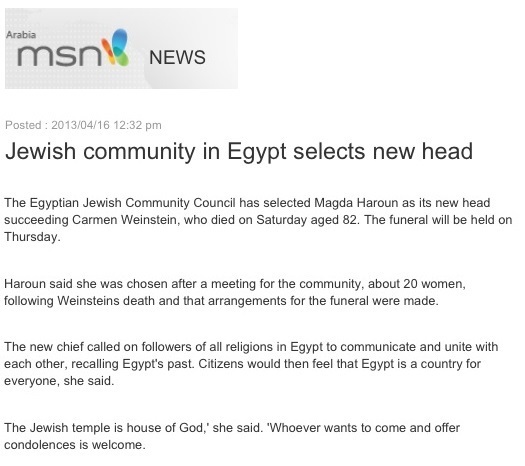 An Egypt open to people from all creeds, nationality and color. An Egypt that was, is and will remain, LARGER THAN LIFE! On behalf of the members of the JCC, our faithful staff and myself, I thank you with all my heart for your unflagging support and kind condolences. As you can understand transitionary periods are difficult and it will take some time before we get back to business as usual. But I promise that my next message will be one of optimism which we all badly need in these changing times. Please accept our gratitude for being there for us and with us. 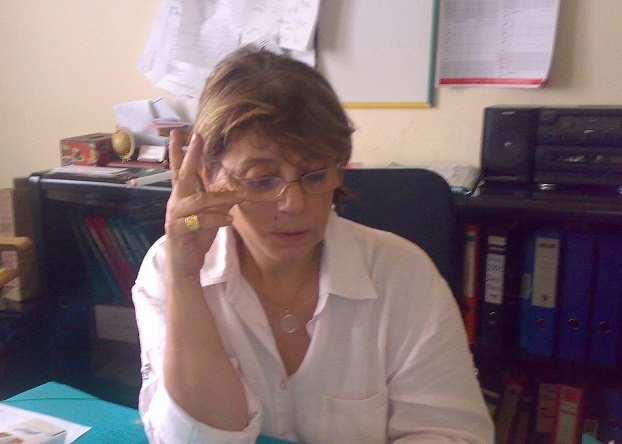 Ce premier message en tant que nouvelle pr�sidente de la Communaut� Juive du Caire est bien s�r entach� de tristesse, car il traite du d�c�s soudain de notre pr�c�dente pr�sidente Carmen Weinstein. Toutefois c�est pour moi un grand r�confort que de voir que vous suivez tous nos nouvelles � travers les m�dias. Cela d�montre en effet que notre petite communaut� du Caire n�est pas seule dans l��preuve. 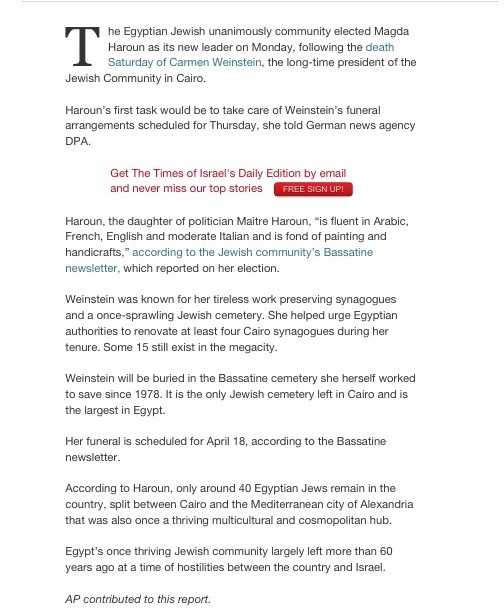 A la nouvelle de la mort de Carmen Weinstein le 13 avril les appels t�l�phoniques, tweets�; t�l�grammes, messages et fleurs ont afflu� de partout�. Et bien s�r il y a eu tous ceux qui ont assist� au service le 18 avril. Lors de cette comm�moration au temple de Chaar Hashamaim et lors de la r�ception des condol�ances j�ai vu beaucoup d�amis mais autant d��trangers. J�ai rencontr� les repr�sentants d�ONG �gyptiennes et internationales et des diplomates accr�dit�s au Caire. Il y avait aussi des repr�sentants �minents de l��lite intellectuelle et culturelle �gyptienne ainsi que de nombreux d�l�gu�s des m�dias. Musulmans�, Coptes�, Catholiques et autres s��taient joints � nos coreligionnaires dont certains �taient venus d�aussi loin que d�Am�rique et d�autres simplement d�Alexandrie. Tous �taient l� pour rendre hommage � celle qui, se d�pensant sans compter et sans m�nager sa sante avait r�ussi malgr� tous les obstacles � prot�ger notre h�ritage physique, culturel et religieux. J�ai �t� �mue et r�confort�e � la vue de jeunes �gyptiens qui �taient venus parce qu�ils avaient soif de mieux nous conna�tre. Il y en avait parmi eux qui ne savaient pas qu�il restait encore quelque chose de la communaut� juive� mais qui voulaient pr�senter leurs condol�ances pour la mort d�une femme qui �tait �gyptienne comme eux mais qu�ils n�avaient sans doute jamais rencontr�e.  Les uns comme les autres �taient l� pour saluer la disparition d�un symbole d�une Egypte qui n�est plus. 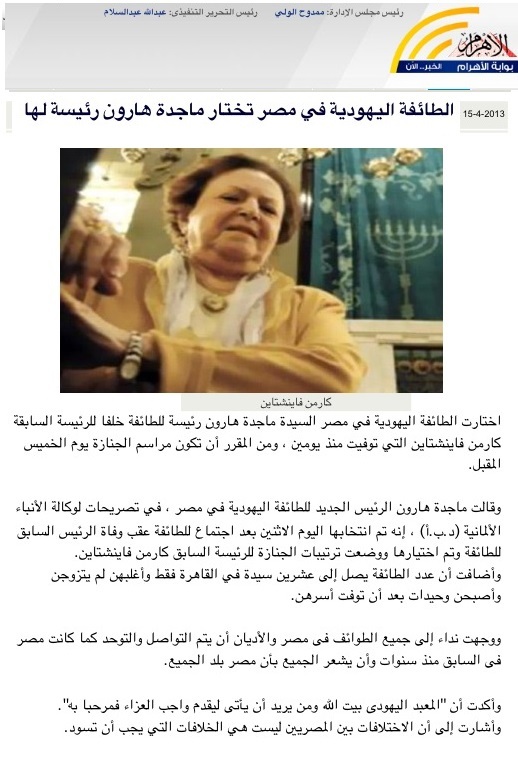 Une Egypte ouverte � des hommes et des femmes de toutes les religions, de toutes les nationalit�s, de toutes les couleurs. Une Egypte qui �tait, et qui reste encore plus grande que nature. Au nom des membres de la communaut�, de notre fid�le �quipe et en mon nom je vous remercie du fond du c�ur pour votre soutien in�branlable et vos sinc�res condol�ances. Comme vous pouvez le comprendre, la transition ne sera pas facile et il nous faudra du temps pour reprendre les choses en mains. Je vous promets que mon prochain message sera un message plein de cet optimisme dont nous avons tant besoin en cette p�riode de grands changements. Acceptez toute notre reconnaissance pour avoir �t� l� pour nous et avec nous�. WHO IS THE NEW JCC PRESIDENT? Madga-Tania Chehata Haroun Silvera (Maggy to her friends) was born in Alexandria on 13 July 1952, the older of Chehata and Marcel Haroun�s two daughters. 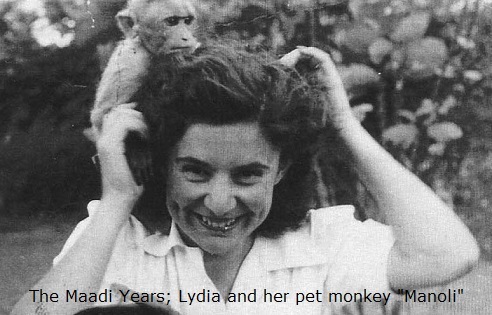 Magda attended the Lycee Francais School in Bab El Louk, Cairo before graduating from Cairo University�s School of Applied Arts. Later, she joined the firm of Haroun & Haroun Patents/Trademarks and Legal Affairs partnering with her lawyer sister Nadia C. Haroun. The Haroun sisters were raised in a home where humanitarian values were sacred. Their father, Maitre Haroun (1920-2001), was a man of definite convictions and the reputed humanist and founding member of the Tagamu Party along with other leading Egyptian politicians. A mother of two university graduate daughters, Magda Haroun is fluent in Arabic, French, English and moderate Italian and is fond of painting and handicrafts. 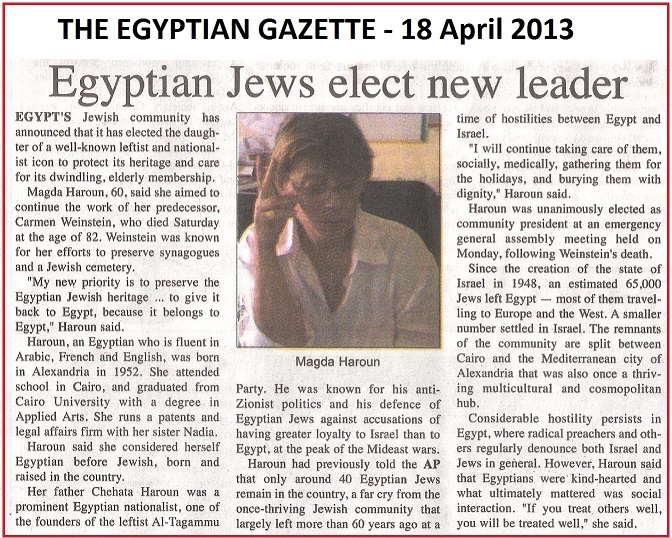 Magda Haroun was unanimoulsy elected JCC president at an extraordinary general assembly meeting held in the afternoon of Monday, 15 April 2013. 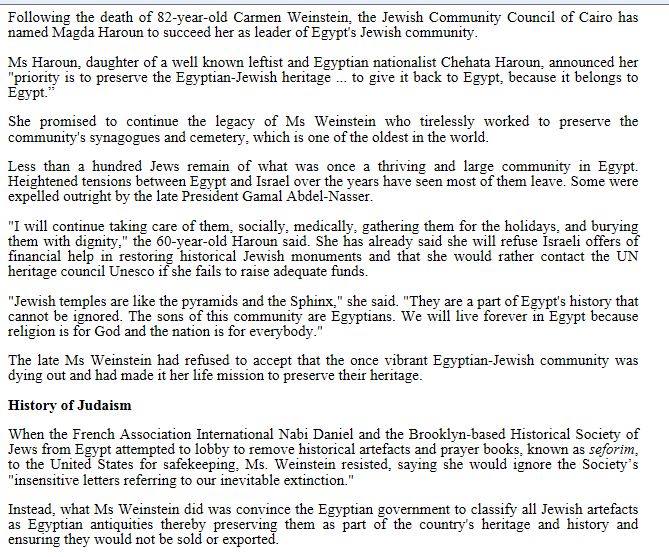 It was attended by various senior members of Cairo's Jewish community. 20th Century JCC presidents included an enobled banker, a finance minister, an Olympic champion/department store tycoon and a conservationist-playwright. The last two JCC presidents were women. Magda Haroun is the third member of the female gender to occupy the post.